It’s hard to believe, but it’s true, I’m not a huge fan of shorts. I used to wear them all the time, but as I’ve got older I now tend to gravitate towards long flowy skirts or cute summer dresses. To some people denim shorts of hugely significant of summer, in fact their summer wardrobes consist of multicolored denim, distressed denim, the list goes on. Sam Greenes, friend and head buyer at Blue & Cream, is almost never spotted at work without her denim on. I love how she pairs them with a variety of loose tanks and tees and a great pair of Marant sneakers or a classic Tkee to make the traditional warm weather look her own. For Sunday brunch this past weekend I decided to channel Sam. For the first time this season I wore a pair of J.Brand cutoffs that Sam had promised I’d need and eventually wear, with a favorite white oversized Enza Costa tank and Haviannas. It was the perfect casual Sunday look for brunch with friends and then a walk around Soho. 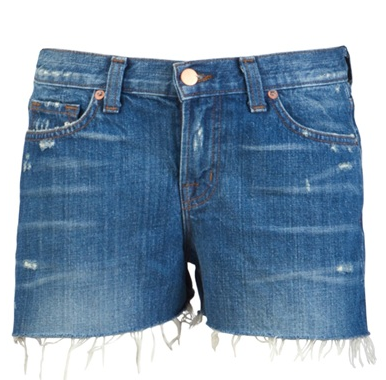 It’s never too late to find another summer staple, because well there’s always next summer, so for the next few weekends from the Hamptons to Boston I’ll be rockin’ some denim a la Sam, xo.